If you happen to command a film star's salary, then there's a posh villa awaiting you in Cambodia! It's an increasingly popular option for the very well-heeled tourist. 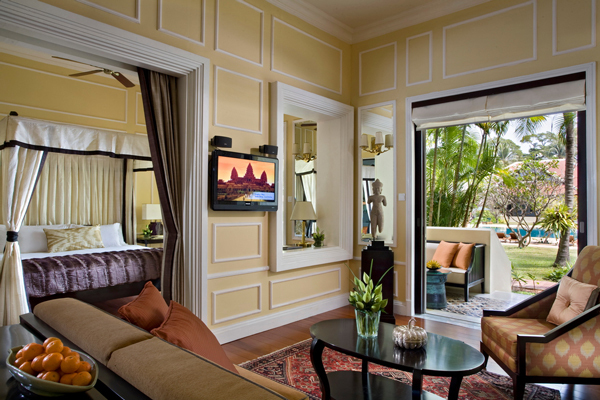 The two private villas in the grounds of the Raffles Grand Hotel d'Angkor are holiday homes with a luxury difference. For about 2,800 US dollars a night, they offer families and small groups the ultimate Temple-Town residence. Recent guests include Angelina Jolie and Michelle Obama. With vast living rooms, polished wood floors, and huge bedrooms, the villas offer a luxury retreat after a day exploring Angkor's famous temples. Built just three years ago, the Villa Ni Say features a 16-metre salt-water infinity pool with an underwater bench where guests can sit for a chat and a drink. It was designed by French-Cambodian architect Lisa Ros, who aimed at integrating modern comforts and lush surroundings. The main living area's huge windows can be swung open to connect with the garden, or sealed shut if you need air-conditioning on hot days. There are six colour-themed bedrooms, all en suite, accommodating up to 14 guests, and the villa is serviced by a full-time Cambodian and Western team of five staff offering a high level of personal service. Villas are also available for rent in the Cambodian capital of Phnom Penh. These are more modestly priced, at 140 US dollars per night or 2,000 dollars for a month. The main attraction is the large tropical garden and swimming pool - a welcome oasis from the heat and dust of the city. The growth in luxury villas reflects a thriving tourist industry for Cambodia. According to government data, the country saw almost 5 million visitors last year, double the number of 2010.